SeaClear's 20 Gallon Hexagon Tanks allow you to create a dramatic and impressive aquarium set-up using a minimum amount of wall space. 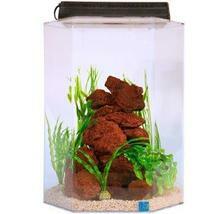 The unique shape and exceptional clarity of acrylic allow you a panoramic view of your fish. Made from the clearest material available, they're 17 times stronger and less than half the weight of a comparably sized glass aquarium. 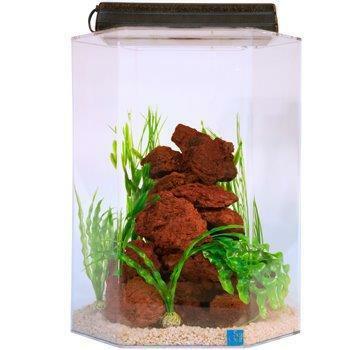 Since acrylic is impervious to the corrosive effects of saltwater, SeaClear acrylic aquariums are suitable for both fresh or saltwater use. These tanks are lightweight, chip resistant, strong and resistant to leaks thanks to the smooth rounded corners and seamless front. Includes a UL listed fluorescent light fixture (bulb not included). 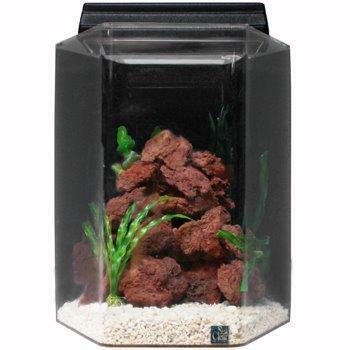 SeaClear acrylic aquariums, manufactured by CASCO Group, Inc., carry the limited lifetime warranty against leakage.